Showing the transition from fall to winter is now more dramatic with our first snow fall! 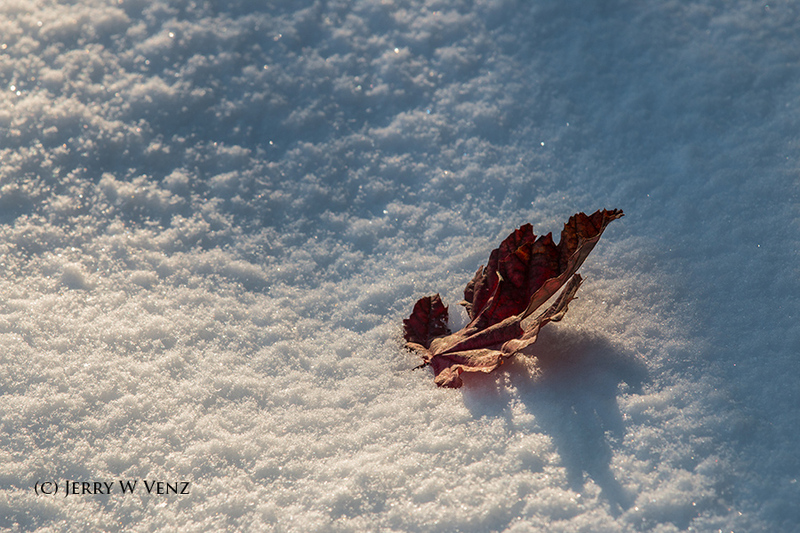 I start by isolating fallen leaves against the snow--in my backyard. I like the back light here from the low morning sun skimming over the snow creating nice detail throughout the image. 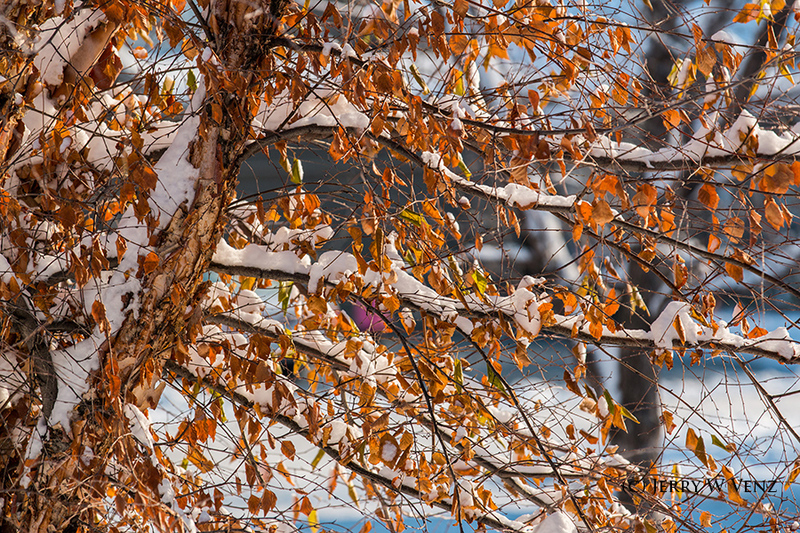 I zoomed in to frame a piece of this tree just on the other side of our backyard fence with a fairly wide aperture to de-focus my neighbor's house across the street. Moving to my front yard later in the day, I return to my favorite little tree. This tree drops it's leaves very slowly and hangs on to it's berries well into the frigid winter. 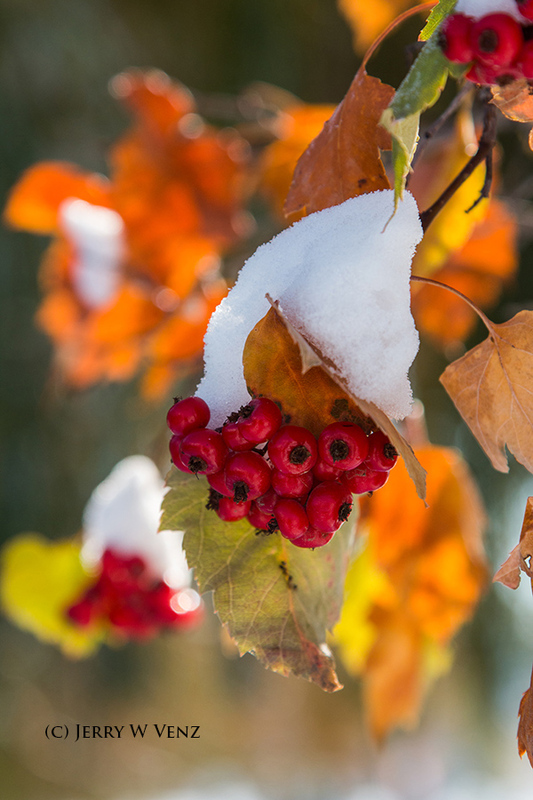 I waited for the later sun to back light the tree's leaves, so the cool snow covered berries would have a warm contrasting background. 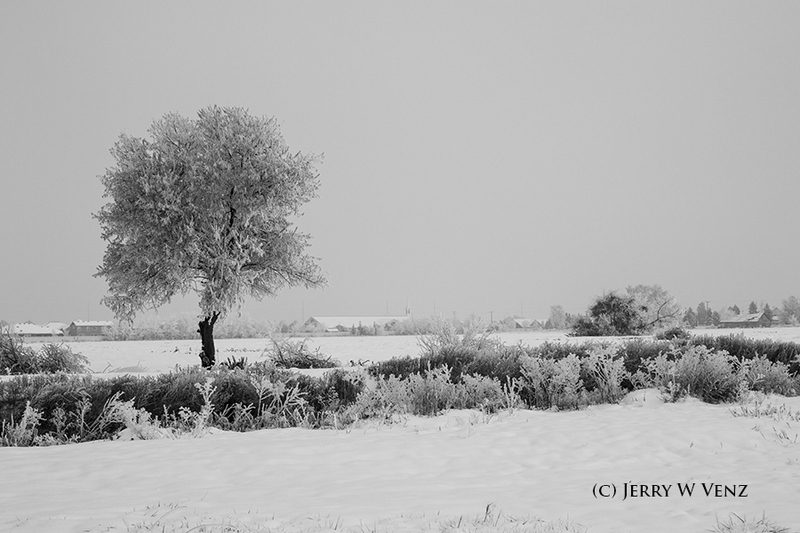 The very next morning the jet stream dropped that cold Canadian air, into our part of Idaho, creating my favorite winter condition to photograph: Freezing Fog! 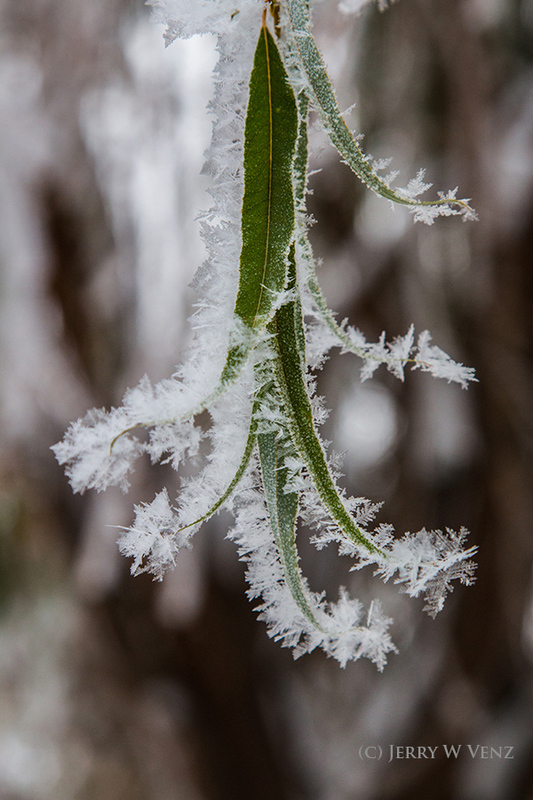 Coating EVERYTHING outside with delicate ice crystals…it's like Christmas in November! Hey, what can I say, I'm a transplanted California--I'm not used to REAL winters! I bundled-up in my warmest snow gear--it was 7º out there--and decided to use my Canon 70D again for this kind of weather. I don't use my 5DMKII in nasty weather--it's my money-making portrait camera! 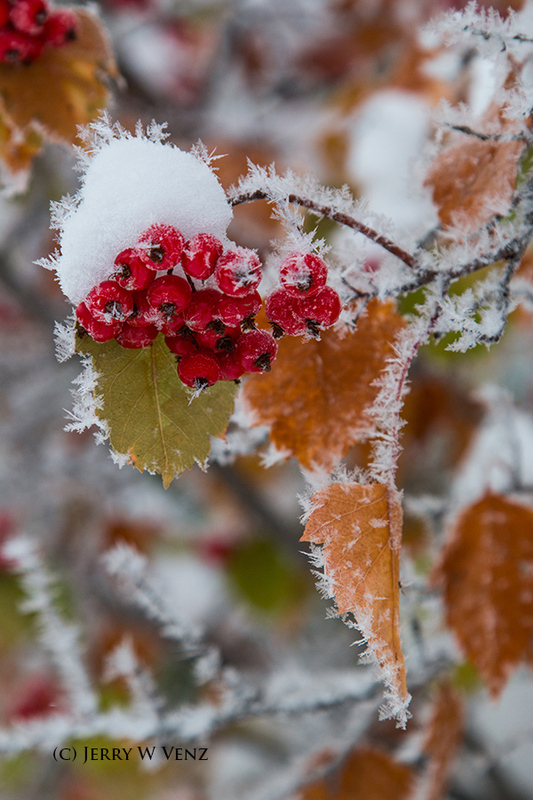 I went right out to my little tree to capture the snow covered berries NOW with ice crystals on the edges of everything. Neat! One of my favorites was this cluster of leaves hanging down on the weeping willow tree next to our house. Great Ice Crystals! Walking to our common area a block from our house I got this nice view of the open farm area with everything dressed in ice. I could go on and on--I've got hundreds of great images just from these two days. Back to my main point. If you're in snow country, you have NO excuses, just take a walk around your house, and LOOK around! If not there, surely within a block of your home great images a wait you!